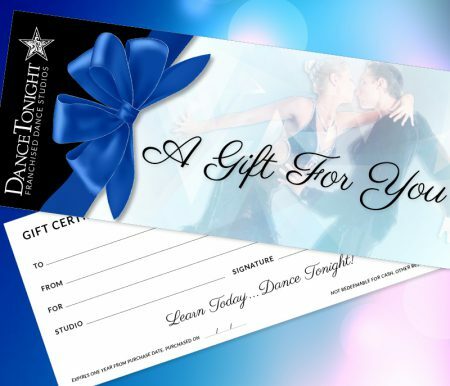 If you are looking for a gift for someone who is new or newer to dance, then this is a great option! For $100 total the new student receives two forty minute private lessons introducing them to social dancing. A selection of dances are introduced to the student, and this can be catered to their interests as they try out ballroom dancing. Private lessons are for an individual or a couple, so two certificates are not necessary for a couple unless they want separate private lessons. This Introductory Special is only for those who have never taken private lessons at our studio before. 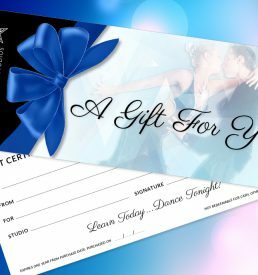 Next time you need to get someone a gift, think of a Dance Tonight Gift Certificate as something different, fun, and a gift that they will remember! After purchase you will receive a link to a downloadable gift certificate via email.